A newspaper photograph from The Tampa Times on January 4, 1968, describing a concert with the bands The Tropics and The Rascals. 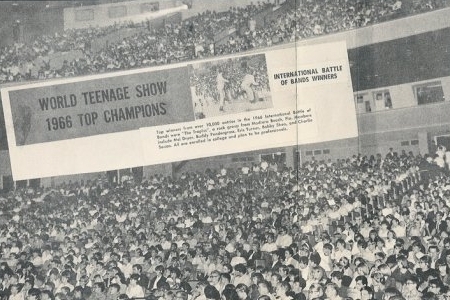 In this photograph, a large banner hangs from the upper level that reads, "WORLD TEENAGE SHOW 1966 TOP CHAMPIONS," and "INTERNATIONAL BATTLE OF THE BANDS WINNERS." Original newspaper article. "Tropics, Rascals--Fans Love 'Em." The Tampa Times, January 4, 1968: Profiles: Bands & Artists, Tampa Bay Music Scene Historical Society. Digital reproduction of original newspaper article: Author unknown. http://www.tampabaymusichistory.com/resources/15743_215140827836_215085887836_4171118_2836496_n.jpg. 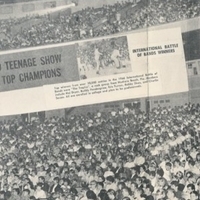 “World Teenage Show 1966 Top Champions.” RICHES of Central Florida accessed April 22, 2019, https://richesmi.cah.ucf.edu/omeka/items/show/5456.